Emerald ash borer (EAB) is a small, iridescent green beetle that kills ash trees. The invasive insects lay their eggs just inside the bark, and when the eggs hatch, the larvae eat the nutrient layer of the tree, causing it to decline and eventually die. 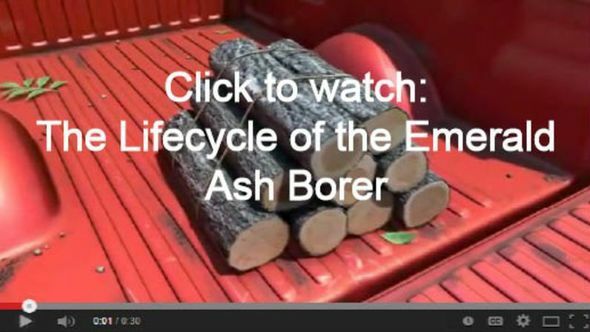 Below is the Minnesota Department of Agriculture’s (MDA) video on the lifecycle of the EAB. All ash trees are susceptible to EAB and millions of ash trees have been killed already in other states. Minnesota is especially vulnerable because we have more ash trees than any other state. Ash trees make up 15.1 percent of the trees in Minnesota communities, but in some cities account for as much as 25 to 30 percent of the tree canopy. Thus, EAB poses a devastating economic and environmental threat to our state. The current EAB infestation in Minnesota affects the Twin Cities area as well as Winona, but the insect spreads quickly and there are no known native predators to stop EAB in North America. Human activity is the major culprit behind the spread of EAB through transported firewood. To prevent further movement, affected counties are under state and federal quarantines which make it illegal to move any ash wood or products. EAB quarantines are now in effect for the counties of Hennepin, Houston, Ramsey and Winona. Buy firewood wherever you are camping instead of bringing it with you. Dispose of ash wood properly by observing the county quarantines. What do you do if you have an ash tree? If you live outside of Hennepin, Houston, Ramsey or Winona counties, EAB has not yet been detected near your home. If you have an ash tree, learn to identify ash trees and EAB. Contact MDA’s program, "Arrest the Pest" if you see signs of EAB. Do not treat your ash trees with insecticides, as EAB is not yet present in your county. Avoid unnecessary use of insecticides, which should only be used when pests pose an immediate threat. Enjoy your ash tree and watch the news for updates on EAB presence in your community. Determine whether your tree is infested with EAB. Because larvae are inside the bark, it is often difficult to detect EAB. 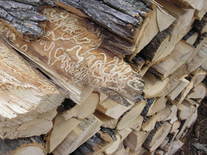 Visit MDA’s webpage “Does My Tree Have Emerald Ash Borer (EAB)?” to learn more. If your tree does not have EAB, healthy trees in these counties have the option of being treated to avoid infestation. Learn about insecticide options in this handout (pdf). To reduce chemical use, we recommend careful consideration before you treat your tree. If your tree already has EAB, or it is healthy but you choose not to treat it, it will eventually get EAB and die. Monitor your tree and safely remove it before it becomes a hazard. If you cut the tree yourself, be sure to bring all the wood waste to a disposal site within your county. You must not move any part of this tree (or other wood) outside of your county. Look at MDA’s website for drop off locations for your downed tree. Don’t leave stumps or branches in your yard for decoration or play; quick disposal will destroy any emerging adults from infested wood and top them from flying to nearby trees. When you cut your ash tree down, replant with a new tree! Sign up and become a Minnesota Forest Pest First Detector to become active in scouting for EAB and other invasive pests in your community. First Detectors are the front line of defense against infestations and your help detecting these pests early helps to minimize the impact they can cause. Kristin Taggart, Minnesota GreenCorps Urban Forestry member serving in the city of Hutchinson, works on the city’s EAB preparedness program. She works to increase community awareness of EAB and other invasive species by developing diversification projects, planting trees, connecting with homeowners and helping create Arbor Day programs with local schools. “With the threat of EAB fast approaching, ash trees are the primary target for removal and replacement over the next 10-15 years. Further public outreach and education on the importance and benefits of a sustainable urban forest are essential to my GreenCorps project,” said Kristin. If you think your community would benefit from an EAB preparedness program as well, encourage community leaders to apply to be a GreenCorps host site. Minnesota GreenCorps, an environmentally focused AmeriCorps program, is now accepting member and host site applications in preparation for another year of preserving and protecting Minnesota’s environment. Urban forestry is just one of their programs. They also serve projects in the areas of energy conservation, green transportation, waste prevention, local foods, stormwater, and living green. Interested in educating others on how to live a healthier, more sustainable lifestyle? If so, consider presenting at the 2014 Sustainability Stage in the Eco Experience building at the 2014 Minnesota State Fair. Demonstrations and performances on a variety of topics including yard and garden, energy, water, food and creative ventures. To apply, read the detailed instructions on the online application form then fill out the application and submit it electronically. Applications due April 11, 2014. Join Do It Green! for their inaugural fundraiser in support of their 14th year of sustainability education in Minnesota communities! April 17, 6:30 p.m., Summit Brewery, (St Paul). Join Metro Clean Energy Resource Team (CERT) Spring Resource & Networking event. Hear about clean energy projects, work that is happening in communities all over the 11 county metro area and find out how to start a project in your community. April 17, 4:00 p.m.-8:00 p.m., Bullard Rainforest Auditorium at Como Park Zoo Visitor Center, (St Paul). The Iron Range Partnership for Sustainability will host an Earth Fest celebration of local traditions and practical resources for sustainable living on the Iron Range of Northeastern Minnesota. April 26, 9:00 a.m.-4:00 p.m., Mt Iron Community Center, Messiah Lutheran Church and Merritt Elementary, (Mt. Iron, MN). Celebrate Arbor Day this year! April 25 kicks off an entire month of celebrations and incentives for replacing trees lost during the past years' tornadoes, floods, blowdowns, and snowstorms. Visit the DNR’s 2014 Arbor Month page to locate a celebration near you. Check out the Minnesota’s Arbor Month Celebration, which includes the state’s tree climbing championship, nature play opportunites, education and musical performances. May 17, 9:00 a.m.-12:00 p.m., Oak Hill Park, (St. Louis Park).